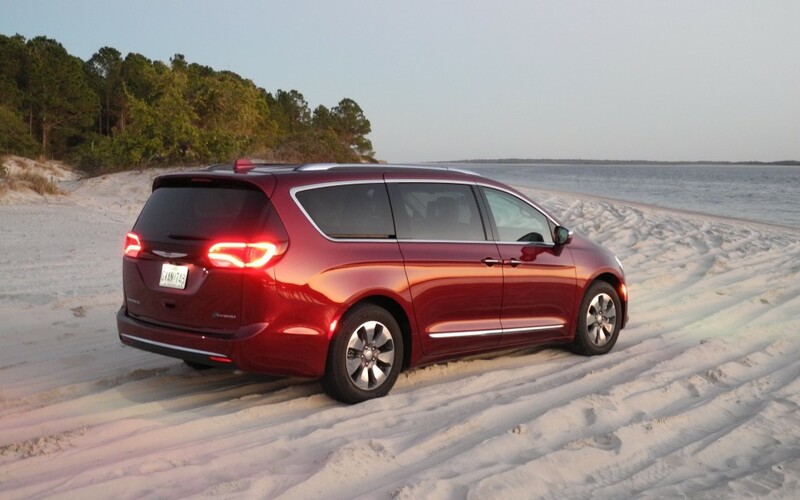 Chrysler’s all-new Pacifica minivan, particularly in hybrid form, promises to be an ideal vehicle for a long-distance family vacation. So we decided to put it to that test. The last time I drove a Pacifica I was 40 pounds lighter and I had to keep sweeping my hair out of my eyes. Let’s just say it’s been a while. That was a very different vehicle as well as a different time, of course. The original Pacifica arrived in mid-2003 in the form of a five-door wagon with hinged doors all around, lest anyone confuse it with a minivan. It did employ a heavily modified front-drive minivan platform, but with a lower roofline and wider track. It concealed its minivan underpants in the guise of an adventure vehicle. 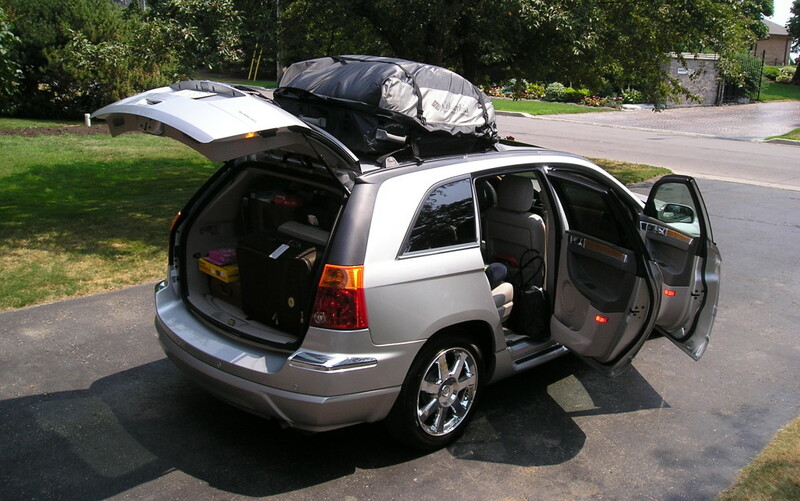 Still, it was hard to load everything a family of five needed for an east coast vacation. We ended up buying a massive cargo bag that strapped to the roof, since the storage space behind the third-row seats could scarcely hold a box of Kleenex. 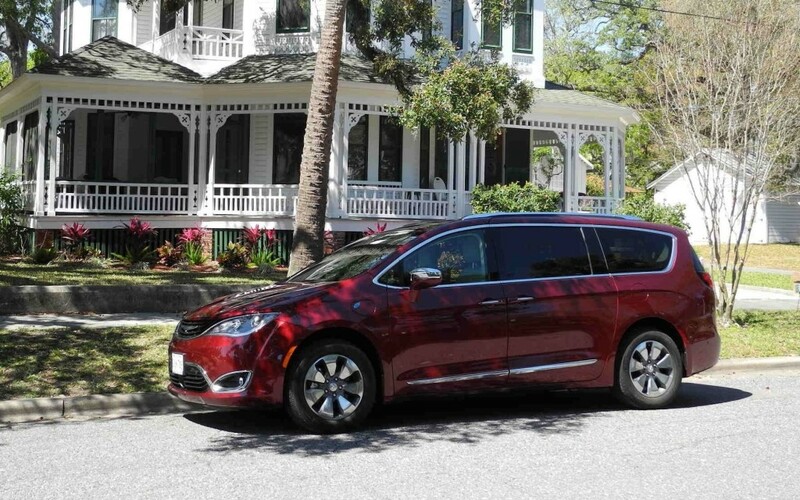 While that Pacifica was a nice driving crossover for empty nesters, busy families would likely have taken a pass. Fast forward almost 15 years and the Pacifica nameplate is now attached to an all-new minivan, built on Fiat’s“compact wide” platform that also underpins the Chrysler 200 and Jeep Cherokee. Its European breeding is evident in the crisp damping action, rattle-free composure and decent turn-in. The van drives smaller than it actually is. What makes the new Pacifica particularly interesting is that Fiat Chrysler made it available with the first plug-in hybrid drivetrain in a minivan. The hybrid model features the 3.6-L Pentastar V-6 engine, modified to use the efficient Atkinson combustion cycle, together with two AC electric motors for a combined output of 260 hp. A 16-kWh lithium-ion battery pack lives in the floor-well where the second-row Stow ’n Go seats would have been stored. In this model they’re replaced by captain’s chairs that are vastly more comfortable. We’ve driven every kind of van on the market during our annual spring-break migration to Florida. Our family stubbornly makes the trip the old-fashioned way: a two-day driving marathon fueled by bad coffee and dry Clif bars. 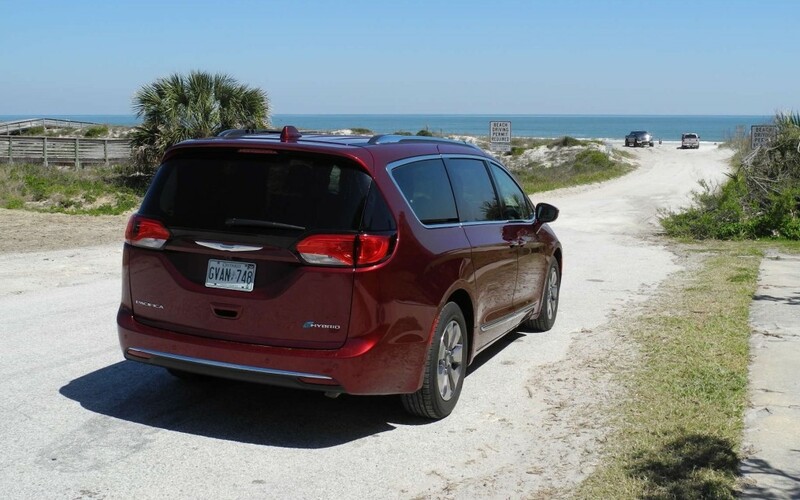 I was curious to see if Chrysler’s hybrid van could deliver genuine fuel savings in a real-world 4,500-km test drive to Amelia Island, which is the first Florida exit on I-95 south of Georgia. We fled Toronto on a snowy Saturday morning and crossed the border at the Rainbow Bridge in Niagara Falls, clearing U.S. Customs in just ten minutes. An hour later we joined the I-79 at Erie, Pennsylvania, and aimed the Pacifica southward. 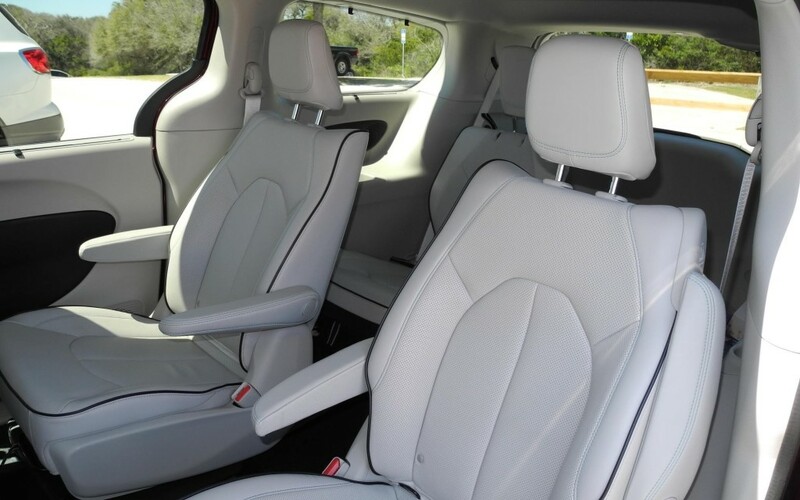 FCA had loaned us a Pacifica Hybrid in full-zoot Platinum trim, which included vented leather upholstery, a video entertainment system and a bevy of electronic driving aids, such as navigation, lane minder and adaptive cruise control. The van felt weighty – at almost 5,000 lb 92268 kg), it is – but with the battery pack tucked below the floor, the lower centre of gravity aids handling. There were no road imperfections that could unsettle this van during our travels, and expansion joints were a distant thrum under the 18-inch Michelins. Designers made the cockpit feel intimate rather than wide and expansive. The controls are neatly laid out on the centre stack and include Chrysler’s rotary gear selector. While it works well, drivers shouldn’t get careless or impatient with the mechanism. There are stories of drivers who have left it in gear and exited the vehicle, only to witness their new car roll into a tree or fence. We made Charlotte, North Carolina, by the end of the first day, a 13-hour drive that was remarkably complaint-free. My wife pronounced the seats the best she’s ever experienced in a van, and she did hard time in both the front and back (the four of us did not deploy the third-row seats). The Pacifica is mercifully quiet, thanks in part to an active noise control system that works through the 13 Alpine speakers. 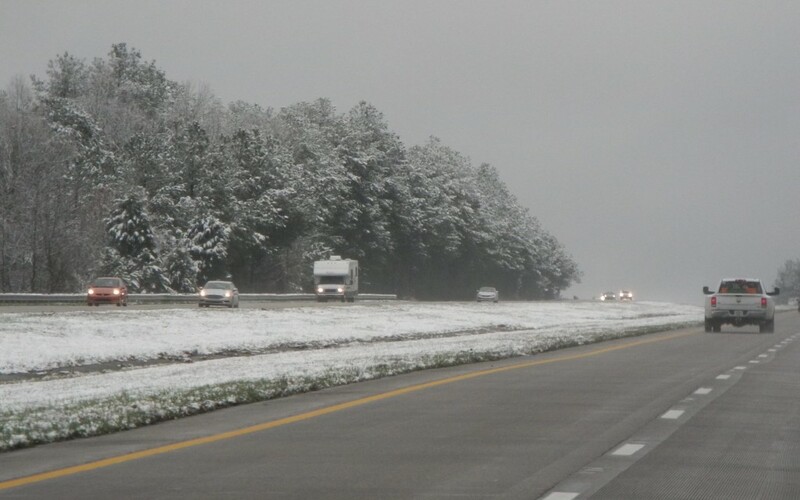 A dusting of snow greeted us in Charlotte on Sunday morning, and we saw more falling as we headed through South Carolina – a bad omen in terms of the weather that would dog us in Florida. I couldn’t help but notice more minivans on U.S. roads this year. 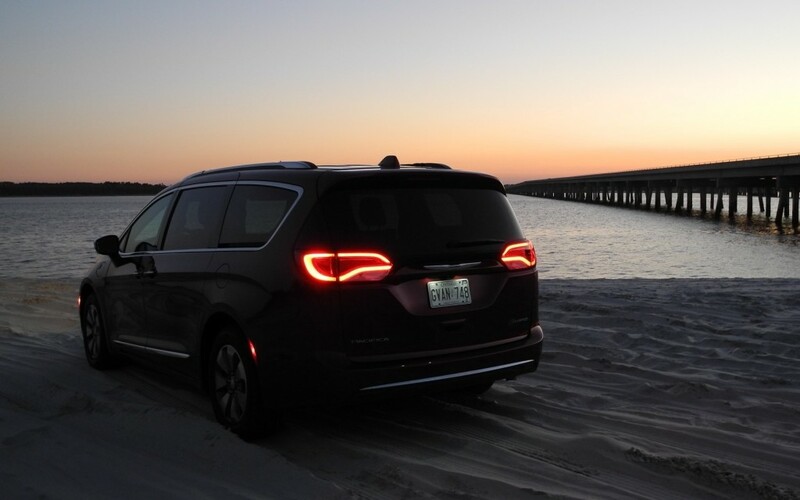 It seems that minivans, like vinyl records, are making a comeback – there was a reported uptick in U.S. van sales last year by as much as 21%, some of that attributed to the Pacifica’s introduction. Canadians, on the other hand, have steadfastly embraced the minivan. Analysts point to more family formation demographically, and a nostalgic streak that sees young families adopting the minivan after recollections of riding in a Caravan or Windstar as kids themselves. There are plenty of new Dodge Grand Caravans around, which is keeping the assembly lines in Windsor, Ontario, humming (Fiat Chrysler says there are no plans to retire the Grand Caravan imminently). Following the I-79 corridor through West Virginia gives every car and truck a good workout as the Interstate climbs some fairly steep grades and snakes down the opposite side, heating up brake rotors. The Pacifica’s hybrid system took it all in stride, although the promised fuel efficiency was not always evident in these conditions. The best fuel consumption rate in the mountains was 9.7 L/100 km (24.3 mpg (US)) according to pen-and-paper calculations after every fuel stop. Our best-ever score of 9.1 L/100 km along the same route was made in a 2014 Honda Odyssey, which employs a variable-displacement V-6 engine that can shut down some cylinders under light loads. However, the numbers improved after the highway flattened out in North Carolina to 8.7 L/100 km ( 27.0 mpg (US)) while maintaining our brisk pace of 130 km/h. The week we spent tooling around Amelia Island in stop-and-go traffic yielded an even better 7.9 L/100 km (29.8 mpg (US)). It reminds us that a hybrid is always more efficient in slow city traffic rather than during high-speed travel. It bears repeating the Pacifica Hybrid is a plug-in model, meaning it can travel up to 53 kilometres solely on an electric charge, although we used that up in about 20 minutes driving across the city at highway speeds. The battery takes just two hours to recharge with a 240-volt charger or 14 hours with a regular cord. But we never plugged it in again (which is likely to be the fate of most plug-in hybrids once the novelty wears off, we suspect – ed). Instead, we relied on regenerative braking to charge the battery and assist our mostly gasoline-powered travel. Speaking of gasoline, all that hybrid gear below deck reduced space for the fuel tank, rendering it small at 62 litres. Chrysler claims its gas-electric system offers a maximum range of 911 kilometres, but in our real-world drive (sans a full charge), we could only travel 650 kilometres between fill-ups. The crowded floorpan also negated a temporary spare tire; Pacifica Hybrid owners get a “tire service kit” with sealant and an inflator. At least the van doesn’t use expensive and poor wearing run-flat tires. 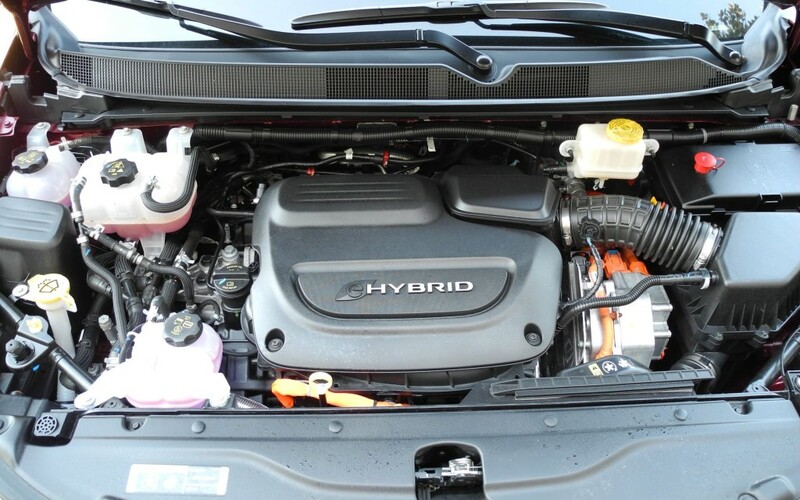 The Hybrid’s whiz-bang technology doesn’t come cheap. Our van topped out at an ambitious $58,390 – but that’s before any government green rebate. Ontario’s Electric Vehicle Inventive program kicks back $14,000 to the buyer, the richest amount in the country. 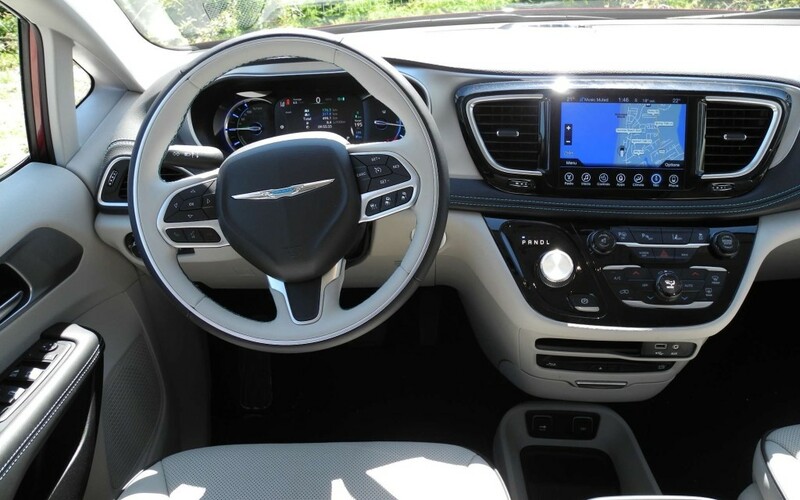 The Chrysler website lists the Hybrid Platinum model at $44,106 after the Ontario rebate. By comparison, the base model Pacifica begins at $36,495 with fewer features. The Dodge Grand Caravan remains the value leader, starting at just over $22,000 with current dealer incentives. Is the Pacifica Hybrid worth the premium? Probably not, based just on fuel savings, even if you drive a lot. But there are other benefits to driving a hybrid van. You get to use the diamond/HOV lanes anytime and some retailers offer reserved parking spots up front; a few even invite you to plug in at no cost. Then there’s the moral superiority. More importantly, the Pacifica Hybrid does deliver real savings where vans do most of their work: on short trips in the city while ferrying kids to class and running errands. Conventional minivans typically burn 14 litres or more per 100 kilometres in stop-and-go driving, underscoring the reality that most minivans are neither mini nor frugal. Unfortunately for us, our spring break week was unusually cool – finally turning warm only as we loaded up the Pacifica for the trek home. Ten (and especially 13) hours behind the wheel is never fun, but the Pacifica made it more than tolerable, thanks to the supportive seats and serene cabin. Over our 4,500-km odyssey (sorry, Honda) the Chrysler demonstrated it could handily defend its title as minivan inventor and innovator. The hybrid drivetrain was largely unobtrusive – except for some cold morning engine warm-ups that were a little noisy – and the eFlite electrically variable transmission (cobbled in-house) worked seamlessly. While our high-speed journey across eight U.S. states did little to highlight the Hybrid’s green credentials (though it did beat or previous record-holding Honda Odyssey), we’re confident that it will be a boon to busy families. 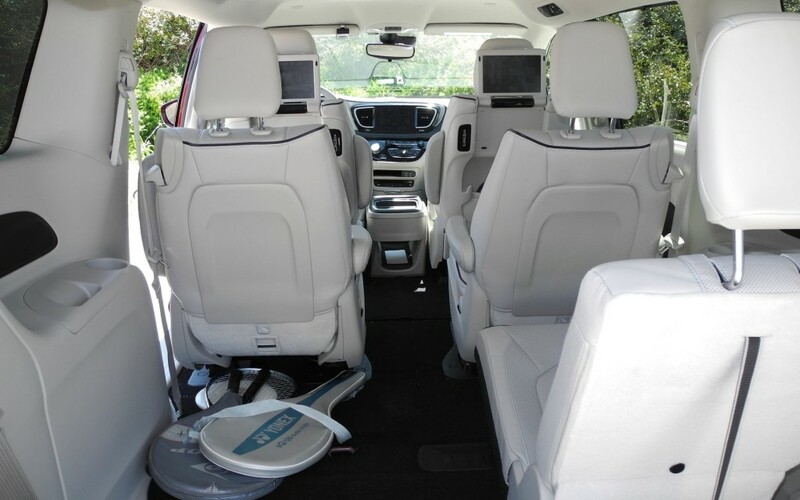 Leave it to the minivan creator to come up with the ideal application for hybrid technology. Take a bow, Chrysler.